On May 3, 2011 the Edge and HOG (Highly Optimized Gear) Buoyancy Control Devices (BCDs) has been jointly recalled with Edge Dive Gear, Health Canada, and the United States Consumer Product Safety Commission (US CPSC). This recall involves Edge Freedom and Stealth BCDs and the HOG 32lb single tank wings. The Freedom is a jacket-style BCD made of heavyweight nylon, and has two removable weight pockets and two back-mounted counter weight pockets. The BCD is black with a blue arch on the lower right side. The word "Freedom" is printed in white letters on the right front, and the name "Edge" is located on a flap over the corrugated hose. The serial number is printed on a tag located in the front right zipper pocket. The Stealth is a back flotation-style BCD made of heavyweight nylon. It has two dump valves, a quick-release chest strap, an adjustable waistband buckle, removable weight pockets and two back-mounted counter weight pockets with seven D-rings. The BCD is black and grey with the word "Stealth" printed in white letters on it, and the name "Edge" is located on a flap over the corrugated hose. Stealth BCDs with serial numbers 000658 through 000697 are affected. The serial number is printed on a tag located in a small zippered pocket under the left weight pocket. The HOG 32lb single tank wing is an oval shaped doughnut style BCD made of heavyweight black nylon. It has four cam strap slots and six bolt holes in the centre with plastic grey inflator buttons. 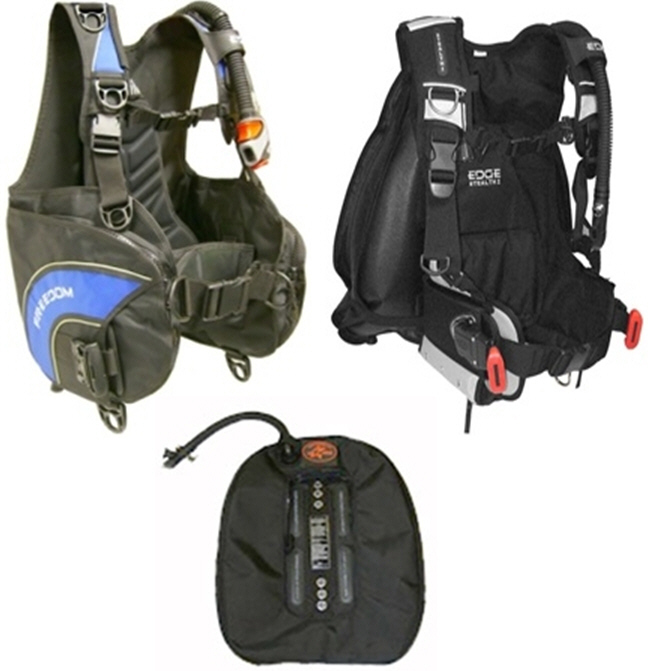 It is designed for single-cylinder diving with a back plate or soft pack harness system. The HOG logo with the words "Highly Optimized Gear" can be found affixed to the top strap of the device. HOG 32 lb single tank wing BCDs with serial numbers 9042128 through 9042128 are affected. The serial number is printed on a tag attached to the inner bladder of the wing that can be opened by a zipper. The spring in the over pressure valve (OPV) can corrode and break causing the buoyancy control device not to hold air, thus posing a drowning hazard to consumers. At time of the recall there have been no reports of incidents or injuries in the United States or Canada. Consumers should immediately stop using the BCDs and return them to an authorized Edge dealer for a free spring replacement. Approximately 20 of the recalled BCDs and HOG tank wings were sold at authorized Edge and HOG dealers in Canada. In the United States, approximately 750 recalled BCDs and HOG tank wings were sold at authorized Edge and HOG dealers nationwide. The recalled products were sold from May 2009 to October 2010. These units were manufactured in China. The distributor is WRK Enterprises dba Edge Dive Gear of Macon, Georgia.